The profile of immigrants to Canada can vary between admission years. Immigrants can face challenges when they arrive in Canada, such as acquiring the ability to speak at least one of the official languages or getting their foreign credentials recognized. The immigrants admitted to Canada in 2015 earned the highest entry wages of any cohort admitted since 1981. The median entry wages of immigrant tax filers admitted in 2015 was $25,400 in 2016. The previous high was $24,800 for those admitted in 2014. Median entry wages are measured as the median wages one year after admission to Canada as permanent residents. These findings are from the 2016 Longitudinal Immigration Database, which allows the analysis of immigrant groups over time and across different admission categories, such as economic immigrants, immigrants sponsored family or refugees. A rising proportion of immigrants have pre-admission experience in Canada, as evidenced by the fact that they held at least one non-permanent resident permit (for example, work permit, study permit or refugee claim) prior to their admission as a permanent resident. For immigrants admitted to Canada in 2015, one-third had pre-admission experience, compared with 20% for those admitted a decade earlier in 2005. For the 2016 tax year, among the immigrants admitted in 2015, tax filers without pre-admission experience had median entry wages of $19,800, compared with $34,400 for tax filers who had a previous work permit. As the proportion of immigrants with pre-admission work experiences in Canada rises, the entry wages of immigrants are increasing. The wages of immigrants increase with the number of years spent in Canada across all admission categories. The median wages of immigrant tax filers admitted to Canada in 2006 were estimated at $19,100 in 2007, one year after admission. For the same cohort, wages increased to $25,700 five years after admission, and $31,700 a decade later. This was also true for refugees, where the median wages of those admitted in 2006 as government-assisted refugees were $8,200 one year after admission, $16,800 after five years and $21,000 in 2016, a decade after admission. In comparison, the median wages of privately sponsored refugees admitted in 2006 were $20,600 one year after admission, $22,900 after five years and $25,800 in 2016. A recent wave of Syrian refugees fleeing political instability in their country were admitted to Canada starting in November 2015. Incomes for these immigrants provide an insight on their settlement progress. The latest Longitudinal Immigration Database includes information on these Syrian refugees admitted up to 2017. From 2015 to 2017, 50,920 Syrian refugees were admitted to Canada, 28,630 of which were 15 years of age or older at the time of their admission. The Syrian refugees admitted in 2015 (6,010) had completed their first year in Canada in 2016, the latest tax year available in the Longitudinal Immigration Database. Among those aged 15 or older at admission, 2016 tax data were available for 94%. The tax data show the median total income of the 2015 Syrian refugees was comparable to those of other refugees admitted during the same timeframe. Syrian refugees had a median total income of $15,400 in 2016, while other refugees had a median total income of $15,300. Among the Syrian refugees admitted in 2015, 43% of those who had filed taxes in 2016 reported wages. Their median entry wages were $11,100. In comparison, 39% of other refugees from abroad who were admitted during the same period and filed taxes reported wages. Their median entry wages were $12,400. The Longitudinal Immigration Database also provides details on the place of residence of the Syrian refugees who filed taxes. Most of the 2015 Syrian refugees who filed taxes were living in the census metropolitan areas of Toronto (31%) and Montréal (28%) in 2016. In the coming weeks, a Statistics Canada analytical paper entitled "Syrian Refugees Resettled in Canada in 2015 and 2016" will be released. The paper will present a broader socioeconomic portrait of the 2015 and 2016 Syrian refugees using 2016 Census data. For the first time, the Longitudinal Immigration Database includes citizenship data for immigrants who were granted citizenship. These data enable new analyses on socioeconomic outcomes for new Canadian citizens. Citizenship rates vary by country of birth, in part because certain countries do not recognize dual citizenship. For the immigrants admitted in 2006, two-thirds had become Canadian citizens by 2016. Among the criteria to become a citizen, most permanent residents must demonstrate their knowledge of one of the official languages. The citizenship rates are lower for immigrant tax filers without knowledge of an official language at the time of admission (60%) than for those with knowledge of French or English (75%). Previous research has demonstrated the impact of citizenship status on economic outcomes of immigrants. A study published by the Organisation for Economic Co-operation and Development in 2011 has cited restrictions to certain types of jobs for non-citizens as one of the possible reasons for wage gaps between citizens and non-citizens. Wage gaps exist between citizens and non-citizens for both men and women. 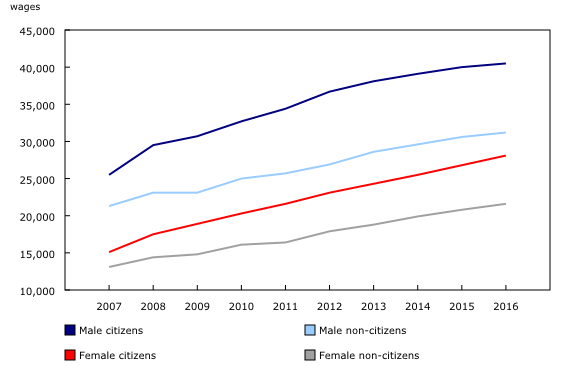 In 2016, the median wages of male immigrants admitted in 2006 who obtained citizenship by 2016 was $40,500, while it was $31,200 for non-citizens. For female immigrants, the medians wages were $28,100 if they obtained their citizenship, and $21,600 if they did not. Overall, in 2016, 86% of immigrant tax filers admitted in 2011 filed tax returns in their province of admission. 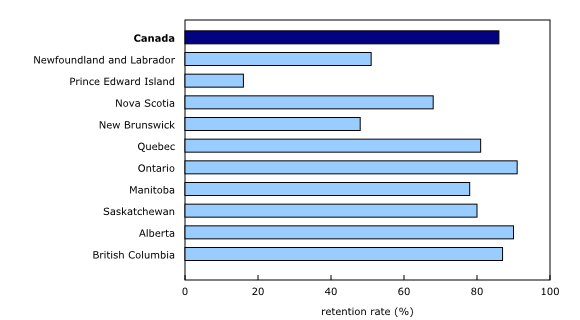 The retention rates were highest in Ontario (91%), Alberta (90%) and British Columbia (87%); the remaining provinces had retention rates lower than the national rate. The Longitudinal Immigration Database allows the study of immigrants' mobility based on their knowledge of Canada's official languages at the time of their admission. Knowledge of official languages has been identified as an important factor related to immigrant economic outcomes and their likelihood to move between provinces. For immigrant tax filers admitted in 2011 with knowledge of French only who had Quebec as their province of admission, 95% were still residing in Quebec in 2016—the highest provincial retention rate when taking into account knowledge of an official language. 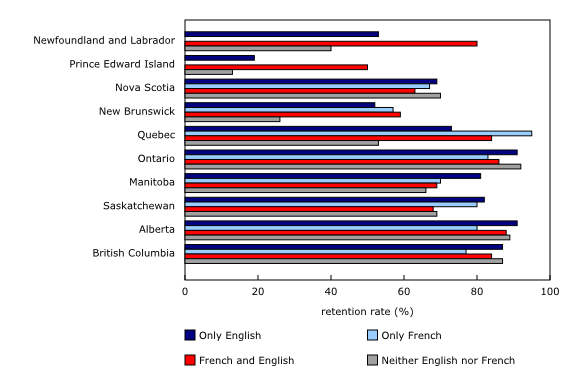 Past research found that, in Quebec, immigrants who know English were more likely to move to other provinces than those who only know French. Outside of Quebec, Ontario had the highest retention rate after five years for immigrants with the knowledge of French only at 83%. The five year retention rates for immigrants with no knowledge of official languages varied widely across the provinces. Ontario had the highest retention rate for these immigrants at 92%. The Longitudinal Immigration Database integrates administrative immigration data since 1980 with tax data since 1982. It provides detailed and reliable information on socioeconomic outcomes of immigrants after their admission, such as employment income and mobility. It connects short- and long-term outcomes with characteristics at admission, such as immigrant admission category, source country and knowledge of official languages. The database also provides information on pre-admission experience in Canada and citizenship acquisition since 2005. For additional information regarding the data coverage and data quality of the Longitudinal Immigration Database, users should refer to the 2016 Longitudinal Immigration Database technical report. Please note that the Longitudinal Immigration Database is updated annually. From year to year, there have been changes to data processing. Each yearly updates are independent. This release analyzes income based on the medians of wages (for the population with wages, salaries or commissions income, excluding self-employment income). The median is the level of income at which half of the immigrant tax filers have higher income and half have lower. Zeros values are not included in the calculation of medians for individuals. Mean income and other income types (self-employment income, investment income, Employment Insurance benefits and social welfare benefits) are provided on the Statistics Canada website in tables 43-10-0009, 43-10-0010 and 43-10-0011; mobility statistics are provided in table 43-10-0012. An upcoming release will provide information on sub-provincial mobility. The total income in this analysis includes wages, self-employment income, investment income, Employment Insurance benefits and government transfers. All income estimates are expressed in 2016 constant dollars to factor in inflation and allow comparisons across time in real terms. Retention rate in this analysis refers to the proportion of tax filers that remained in their province of destination five year after admission. Refugee categories include immigrants who were granted permanent resident status on the basis of a well-founded fear of returning to their home country. These include government-assisted refugees, privately-sponsored refugees, refugees admitted in Canada and their dependents. Economic immigrant admission categories include immigrants who have been selected for their ability to contribute to Canada's economy through their ability to meet labour market needs, to own and manage or to build a business, to make a substantial investment, to create their own employment or to meet specific provincial or territorial labour market needs. Immigrant sponsored family categories include immigrants who were sponsored to come to Canada by a family member who is a Canadian citizen or permanent resident. For a more detailed description of immigrant admission categories, consult the Help centrepage of the Immigration, Refugees and Citizenship Canada website. Immigrant tax filers are immigrants who filed taxes in a given year. The province of admission is the province of intended destination. The knowledge of official language is based on immigrants' self-declared indicators at admission. Reference for the Organisation for Economic Co-operation and Development (OECD) paper: OECD/Garnett Picot/Feng Hou (2011), "Citizenship Acquisition in Canada and the United States: Determinants and Economic Benefit," in Naturalisation: A Passport for the Better Integration of Immigrants?, OECD Publishing, Paris. The 2016 Longitudinal Immigration Database is now available upon request. The "Longitudinal Immigration Database (IMDB) Technical Report, 2016" is now available as part of the series Analytical Studies: Methods and References (Catalogue number11-633-X). To enquire about the concepts, methods or data quality of this release, contact the Social and Aboriginal Statistics Division Client Services (statcan.sasdclientservices-dsseaserviceaclientele.statcan@canada.ca).